I confess. I love Bollywood and as readers of my travel blog Breathedreamgo well know, I love just about everything about Indian culture. For the past 12 years, I’ve been travelling regularly between Toronto and India – where I immerse myself happily in the culture, movies and all. But in September, when the Toronto International Film Festival rolls into town, I don’t have to leave my hometown to enjoy the finest in Indian films. Each year, TIFF premieres several movies from India – from small-budget Hindi movies to blockbuster Bollywood extravangazas. TIFF’s global reach creates a world-wide buzz for these films and attracts Indian film fans, who flock to see some of Bollywood’s biggest stars on the red carpet. This year, there are four Indian films screening at TIFF, and three of them are Special Presentations: The Hungry, Omerta, The Brawler, and Village Rockstars. I’m most looking forward to The Brawler and Village Rockstars. The Brawler, directed by the very talented Anurag Kashyap, is based on a true story about a lower-caste boxer struggling to make his mark on the boxing world. It’s the story of an underdog who overcomes corruption and discrimination to triumph. Village Rockstars is a small-budget film about a 10-year-old girl living in a remote village in northeast India who fights against stereotypes and poverty to pursue her dream of owning a guitar and forming a rock band. It sounds magical. One of the most anticipated events at TIFF this year is an evening with Bollywood superstar Priyanka Chopra – who is also a cross-over star, as she’s big on this side of the world, too, for her role in Quantico. Priyanka Chopra will be the guest of honour at TIFF Soiree, an annual fundraiser organized in support of Share Her Journey, a recently launched campaign to support female voices in screen industries. 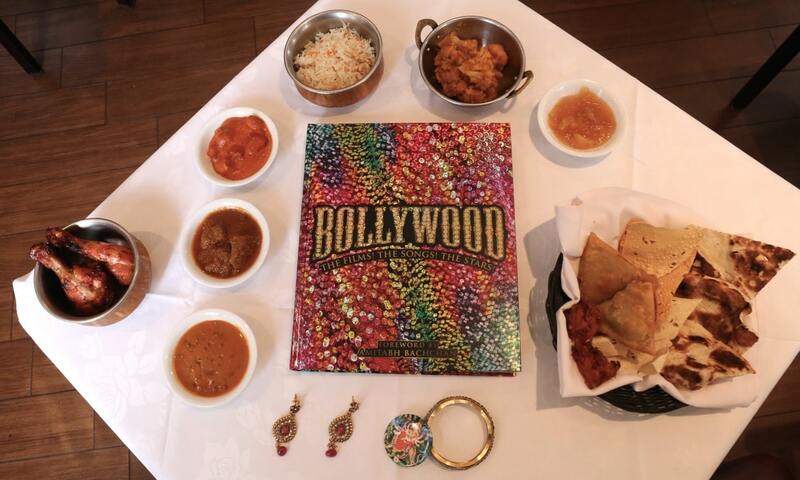 A few weeks before TIFF I was delighted to get my hands on a copy of, Bollywood: The Films! The Songs! The Stars! (DK Publishing, 2017). This book does the genre justice. It’s a hefty tome with a dazzling cover and a mind-boggling array of photos, facts, and fanfare. A “celebration of some of the highlights, milestones, and surprise hits of more than a century of artistry and innovation in India cinema,” it’s a great read and an authoritative resource. The term Bollywood was coined because Bombay (now Mumbai) is the largest film producing centre in the world. By the way, Bollywood Hollywood is actually the name of a movie! Mumbai is one of India’s largest cities, probably the most westernized, and no doubt the most fun. It is India’s dream capital, much like Hollywood, and it also buzzes with energy non-stop, night and day, much like New York. When I’m travelling in India each year, I always make time for Mumbai. It’s an incredible city, a unique mix of colonial architecture and palm trees, glittering wealth and Asia’s largest slum, sophisticated rooftop bars and 100-year-old Parsi cafes. For Bollywood fans, you can hang out at Leopold’s Café in Colaba (South Mumbai) and hope to get noticed for a bit part in a Bollywood movie, you can walk along Bandstand in Mumbai – and hope to get a glimpse of Shahrukh Khan, Salman Khan or one the other Bollywood stars who live in the neighbourhood – or you can drive along the “Queen’s Necklace” (Marine Drive) at night, recreating a scene found in many Bollywood movies. But for those who can’t make it to Mumbai or TIFF, you can content yourself with this dazzling book. It’s arranged in chronological order, starting in 1913, at the dawn of Indian cinema. Each section includes full-colour spreads dedicated to the biggest stars, the most notable directors, and the classic films of that era. Each section is devoted to a different era – such as The Golden Age (1951-60), Enter the Glamour (1961-73), Angry Young Men (1973-81), and The Reign of Kitsch (1981-90). I started travelling in India in 2005, so I was very interested in the more recent sections, Family Matters (1991-99) and The Age of Big Money (2000 to the present). 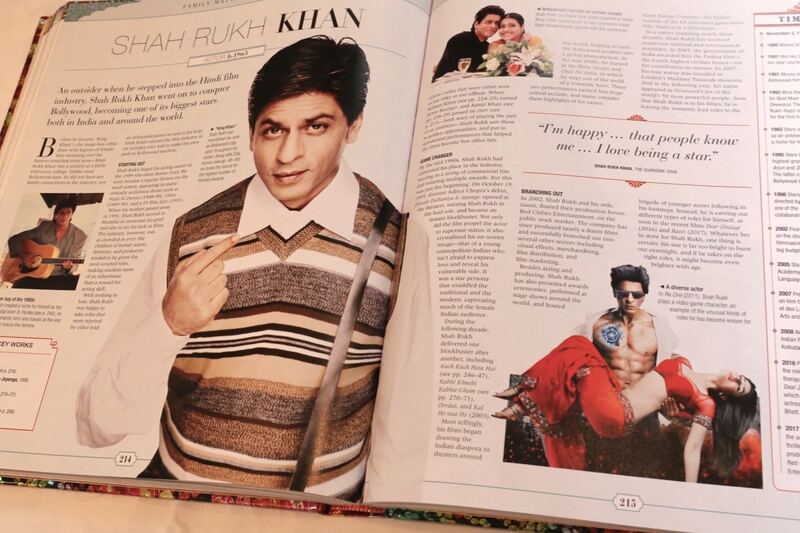 There’s a spread devoted to Shahrukh Khan, of course, one of my favourite stars. I wrote about wanting to meet him several years ago and in fact, I have met him twice since then – once in Toronto and, incredibly, once on the Bandstand in Bandra, across from his home. One of my all-time favourite Bollywood movies is highlighted in the book, Dilwale Dulhania le Jayenge. This is a classic film starring Shahrukh Khan and Kajol, and it’s still playing at a theatre in Mumbai since its release in 1995. 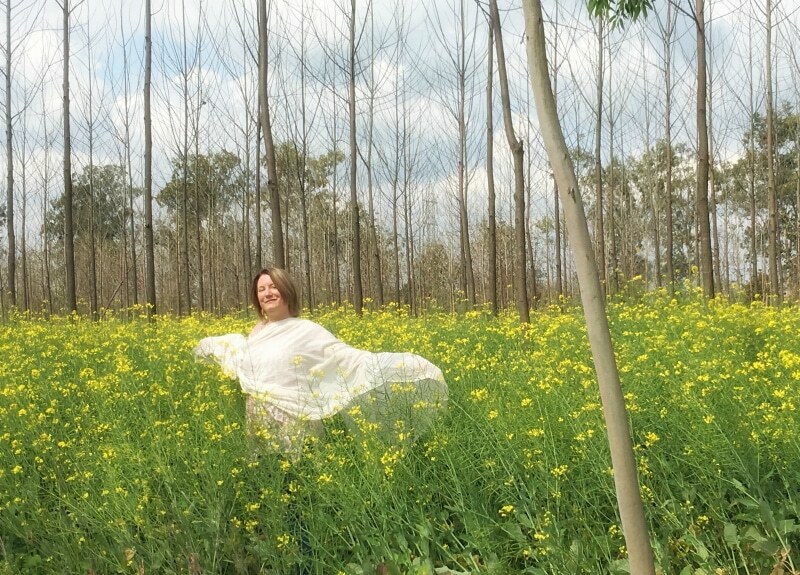 The famous scene when the lovers run towards each other in a mustard field in Punjab inspired me to recreate a similar scene last March when I was in that northern state. More recent films are mirroring the increase in women empowerment in India. One of the biggest hits of the last few years, Queen, was actually a small budget film with a (then) unknown actress, Kangana Ranaut. In the movie, Kangana’s character, Rani (which means Queen in Hindi) is dumped by her fiancé just days before her great big Indian wedding. She decides to go on the two-week honeymoon to Paris and Amsterdam alone – even though she’s literally afraid to leave the hotel room alone at first. She gains confidence, and enjoys herself, and when she gets back to Delhi, and the ex- fiancé wants her back, she has the self-assurance to kick him to the curb, where he belongs. I love the picture of Kangana in this book, staring out with a look of defiance! 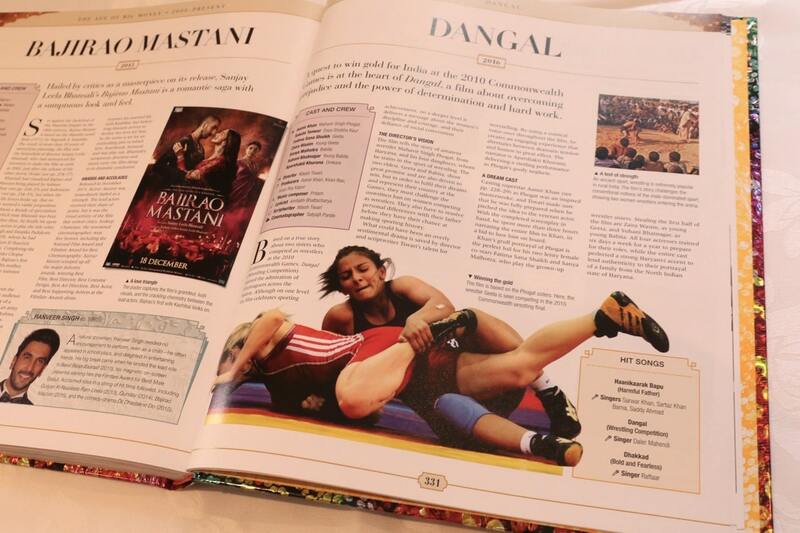 The very last film to be showcased, on almost the last page of the book, is Dangal. This movie has been described as “The Whale Rider of India.” It’s based on a true story about a man who trains his daughters to be wrestlers, and one goes on to win a gold medal at the Commonwealth Games in Delhi in 2010. It’s a true women empowerment movie, and the climax scene, when she wins the gold medal match, made me cry my eyes out. Since I started travelling to India 12 years ago and watching Bollywood movies at TIFF and in India, I’ve seen how Indian films are changing to reflect a fast-changing society. Personally, I can’t think of a more fitting way to honour Bollywood than to support its heroines, and the new generation of women like Kangana, and Priyanka, and others who are finding their inner strength and their voices – and helping to change and shape society.